The King of the Cage promotion has arguably been the state’s foundation for MMA growth throughout the decade and beyond. There start to 2014 exemplifies that argument very well as the 17-fight event “Rumble” featured so many levels of experience from your debut amateurs to first time professionals. Saturday night in the Crowne Plaza Hotel had so many high points to touch on that we decided to start our Monday morning with a look-back at an amazing night of MMA from this past weekend. Before we get into the fight and fighter specific points of the night, we should start with addressing the fact that in the last four King of the Cage shows that SWFight has covered, the promotion has really packed their venues and the crowds have made for a memorable experience in each outing. The four events were the events in 2013 inside Albuquerque’s Sunshine Theater and in the Crowne Plaza Hotel, and the event inside the Ute Mountain Casino in Colorado. “Rumble” was sold-out Saturday night and the ballroom inside the hotel looked over capacity in that people were everywhere and it was very difficult to spot empty seats. Even standing room seemed very congested; which really speaks volumes for the promotion’s ability to book popular fighters and fighters with very big support casts. As we covered in previous posts, this show had over 10-gyms participating and each gym’s section of the crowd made so much noise for their fighters that the venue was buzzing seemingly every fight. I am not sure where to begin and I know I am going to leave out some amazing moments from the evening. In the second fight of the evening, Carlo Rodriguez who is in the Class of 2014 in his High School made his amateur MMA debut against Gary Taylor. It took the teenage Rodriguez less-than 60-seconds to make a statement and announce his placement on the radar for amateurs to keep an eye out for this year. Rodriguez flurried with a crisp combination that ended with a left hook that stiffened up Taylor and put him completely out. It didn’t take long but Judgement MMA’s Carlo Rodriguez was able to earn the KO and an emphatic start to his amateur career. Rodriguez may have set the bar very high for the next fifteen fights but Jerald Aldaco did his best to keep the pace high when he took on Victor Masayesva. Aldaco was taken down early but recovered well and proved to be more than crafty enough to win off of his back. Aldaco worked an armbar very quickly and showed some impressive chain grappling switching over to a triangle choke. While Masayesva defended valiantly, Aldaco slickly used that triangle to roll himself over to top position where he’d work from side control before moving to mount. It was an impressive grappling showcase from Aldaco. With that being said, Aldaco set the stage for teammate Seth Leake to cement the fact that Grants, New Mexico has a legitimate gym to watch out for. The J5’s MMA gym run by Joey Lujan has a very effective system which has been displayed by a three fight win streak from the gym’s fighters. 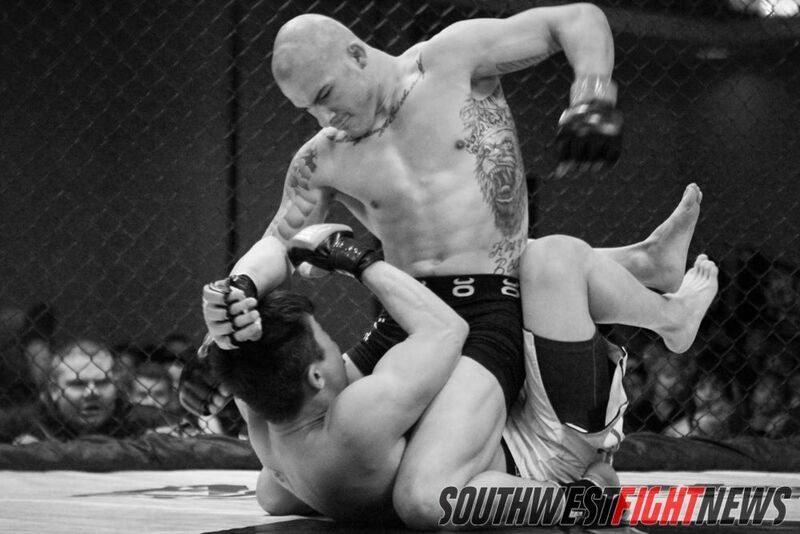 Speaking of Seth Leake, the Middleweight only needed 29-seconds to continue his impressive run as an amateur fighter. In his last fight (his amateur debut), Leake needed to just touch his opponent in order for him to go down and in this bout, he needed only two punches this time. Leake has some very scary power and is very well polished in his technical striking being that he isn’t even 2-minutes into his amateur in-cage career. In the only WMMA fight of the evening, the friendly rivalry between Judgement MMA and FIT NHB was once again brought into the bright lights of a King of the Cage arena. FIT NHB’s Melody Nanez fought her second straight Judgement MMA fighter in Brianna Padilla and the two ladies put on a show. On several instances, the two threw caution to the wind and exchanged punches much to the delight of the crowd. The difference in this fight was the leg kicks of Padilla as she landed hard and often, throwing off the rhythm of Nanez. It should be noted that Nanez is a tough out for any fighter who is willing to go three rounds with a fighter who will take every shot you can offer and will offer you back every bit she can muster in return. Making her amateur debut, Padilla showed very solid technical skills and poise being that in her first fight she went the distance of all nine minutes. FIT NHB’s Ronald Smith used 66-seconds to land solid punches on the feet, earn the takedown, move to the back and sink in a rear-naked choke. The fight was very fast but it showed just how slick Smith is on the mat and how savvy he is at recognizing openings. That was one of the best displays of grappling in an event that featured loads of mat work. The Santa Fe Brazilian Jiu Jitsu Academy showed what fight fans should have already known prior to the start of the two fights featuring the Santa Fe fighters; these guys can grapple. Joel Whitney didn’t use his submission game to win but he did use dominant positional grappling talents. Whitney worked from the guard against Joseph Veloz and once he was able to establish his posture, he unleashed an onslaught of punches that quickly and abruptly ended the bout. Before the referee was even able to assess the danger Veloz was in, Whitney had already landed about ten very solid hammerfists. Whitney’s teammate Aaron Perls may have won the award for comeback victory of the night as he survived a very methodical striking attack from opponent Dorian Dixon in the first frame to mount his comeback in the second. Perls worked very hard for the takedown in the second and he showed exactly why he worked so much to get the fight grounded. Once Perls had top control, Dixon could not escape and Perls was able to land some damaging punches before smoothly transitioning into an arm-triangle. Whitney started a successful night for the Santa Fe BJJ Academy and he did so with powerful hammerfists. Dixon deserves praise for what he was able to do in the first five minutes of his professional career. Dixon looked vastly improved from the fighter he was an amateur. His jab landed with impact on several occasions and his kicking arsenal was definitely scoring often on Perls. Dixon even showed his ability to end the fight with punches as he dropped Perls early in the first with a left hand. It was two very impressive performances from debut pro fighters. While Dixon went home with the loss, the anticipation to watch these two fighters continue their pro fighters in 2014 should come with high anticipation. In what may have been the best fight of the night for an event that had great fights in each of the seventeen bouts, Marcos Mendoza and Mike Taff really put on a show. Mendoza dominated the fight from the start of round one to the end of round bell. After scoring a takedown, Mendoza landed some seriously powerful strikes while working to the mount twice. The round would end with Mendoza attacking with a rear-naked choke from back control with both of his hooks in. The round could have easily been scored 10-8 for the effective offense Mendoza showcased. Mike Taff started the second round with one of the harder leg kicks you will ever see in the amateur ranks. Taff whipped the kick so hard that it buckled Mendoza and Mendoza never really recovered after that. A right hand would drop Mendoza moments later and Taff would jump to mount before earning the TKO finish. It was an impressive come from behind victory and showed that intangible talent of heart possessed by Colorado’s Mike Taff. I doubt I am spelling this correctly but the entrance for Sipu Zenga was one of the best you’ll ever see live. He came out Zenga came out looking like a legitimate samurai or even a ninja sans the weapons. His fight with Andy Varela really had the crowd getting loud as the fight was quick but action packed as a flying knee from Varela started things out before a scramble led to Varela finishing the fight with a tight triangle choke. The fight was fun and it got the crowd buzzing. Charlie Brown Williams out of FIT NHB fought in another fight that truly defines Williams as an amateur fighter and showed why he has been able to find so much success. Williams is very diligent in his attacks and very poised round-by-round. Williams unleashed his patented leg kicks and explosive sweeps to escape danger of takedowns and definitely outworked his opponent on the way to a unanimous decision. In the evening’s title fight, Champion Robert Herrera put in an impressive workload considering he took the fight on less than a week’s notice. Fighting a formidable foe in Mark McGlasson, Herrera once again demonstrated that high level of wrestling pedigree stamped emphatically by one his trademark slams. Herrera was too much on the ground, easily controlling round one and out hustling McGlasson in the second before securing a fight ending submission. Herrera may be a breakout star in the making and it will be interesting to see how King of the Cage handles him going forward. His dominance in his last two outings should definitely put him on the radar as one of the state’s best amateur talents. The 505 Fight Factory 135-pound fighter looks to be a tall task for anyone considering fighting for the title and they better bring in some high level defensive wrestling to duel with Herrera. 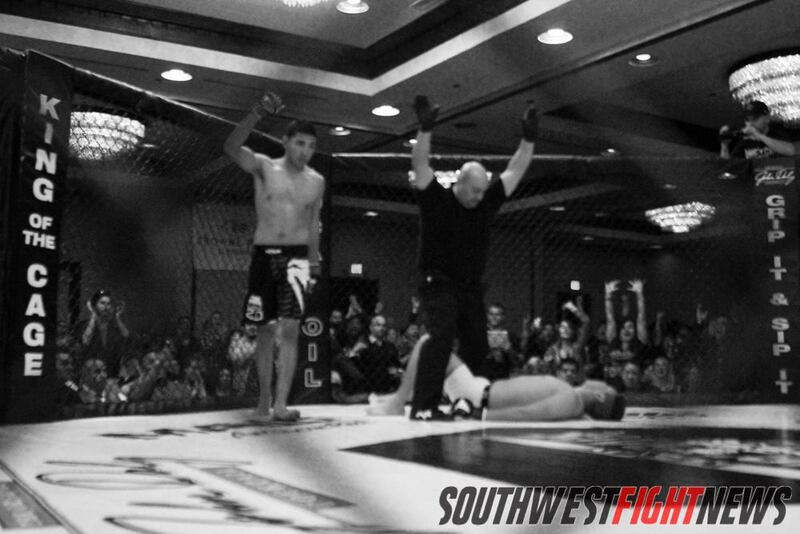 In his first title defense since capturing the KOTC Amateur Title, Herrera dominated once again and retained his title. In the evening’s main event, Judgement MMA’s John Rozema entered into his professional debut with a lot of hype and a lot of buzz behind him. Judgement MMA has one of the most vocal and supportive crowds in the entire state and when Rozema walked out to the cage, the venue was at its very loudest. 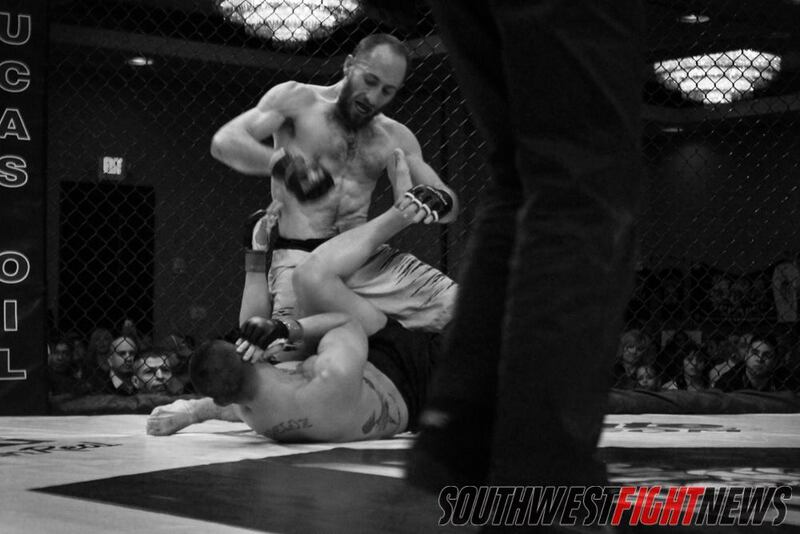 Rozema found himself in a real-fight when he took on David Payne; the Altitude MMA fighter from Colorado arguably stole the first round from Rozema as he was able to land punches, get takedowns and bully Rozema from time to time inside the clinch. It was very close to a legitimate 10-10 round and it could have been scored either way. The story of this fight was the Muay Thai Plum or the double collar tie clinch utilized by Rozema who grabbed onto the neck of Payne several times in the course of two rounds. Payne would close the distance quickly preventing Rozema from opening up with significant strikes. That changed late in the second round when Rozema was able to unleash a flurry of knees from inside that clinch that rattled, dropped and damaged Payne. Once Rozema had Payne hurt, he’d pounce and swarm with huge punches until the referee peeled him off. It was an impressive first pro fight for Rozema and a solid test for him to use to improve going forward. Payne did a great job at taking away the vaunted power strikes of Rozema but as we have seen in the past, Rozema only needs a small opening to land a fight altering strike. While many thought the fight stoppage was premature, Payne had taken some serious damage during the onslaught and one punch that landed to the body of Payne looked like it had him cringing which could have prompted the referee to step in. The argument will always happen when it comes to stoppages but the referee’s job is to protect the fighters and Payne had taken a lot of damage. The “Rumbe” event was awesome and full of exciting fights. If this is any indication as to what is to come for the promotion then King of the Cage is poised to have a very successful 2014!